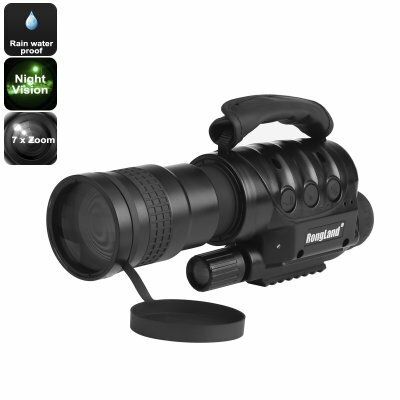 Successfully Added Night Vision Monocular - 7x Zoom, 1000m Detection Range, Weatherproof, Built-in Camera, 16GB External Memory, CCD Sensor to your Shopping Cart. This gadget is a vivid example of a highly powerful night vision scope that has been created by successfully combining digital technologies and observation optics. Offering a 7x zoom, this optical night vision monocular allows you to watch clear in the dark and to spot objects that are located up to 1000 meters away. Equipped with a highly sensitive Sony CCD sensor along with the most up to date digital software this night vision scope provides you with a bright and detailed black and white image even when you are located in a pitch black environment. This is the perfect accessory for any outdoor fanatic and can additionally be used for nature observation, hunting, camping, home security, or even during paintball and Airsoft games. Featuring a built-in camera this night vision scope does not only allow you to see in the dark, it also allows you to snap clear and sharp pictures or footage in complete darkness. Simply insert the included micro SD card and you will be all set to embark on your next night-time adventure while recording everything in stunning quality. Perfect for nature observation, night-time hikes, or after dark sport matches – with this gadget you can be assured that, even after dark, not a single memorable moment in life will stay uncaptured. With its advanced infrared technology this night vision monocular lets you observe objects from both up close as well as afar. Although highly powerful it features energy saving IR-illumination, allowing you to record and observe for hours in a row without the need to worry about battery life. Being waterproof and protected against rain this is the perfect electronic gadget that will provide you with a clear view after dark no matter the weather conditions. Don’t leave yourself in the dark – this gadget offers great visibility in complete darkness, making it a perfect tool to use during any outdoor activity that takes place after dark. This night vision scope comes with a 12 months warranty, brought to you by the leader in electronic devices as well as wholesale electronic gadgets..